FIFA World Cup 2018 in Russia turned out to be an exhilarating affair to the close to 5B people who watched it around the world. But hey, how exciting was it to the African continent? Well, a number of things entertained the world from the African camp, the Senegal national team practice sessions, the 'over de bar' craze from a Nigerian fan and so on. However, there was no significant point to mention on the competition front. The France national team has shown a lot of quality right from the group stages. It is the only team among the Semifinal regulars that has remained strong to the finals, eclipsing huge opponents including Argentina, Uruguay and Belgium. These victories confirmed France as global champions in 2018 and truth be told, much of the French national team success has come from a host of players with deep African roots. Yes, the squad includes very significant African roots, and this could be key to landing them a second World Cup title, 20 years after their first in 1998 when they hosted the tourney. There are 15 players to be exact in the 23 man squad, who have a connection to the African continent! This year's World Cup has marked the very first time an African country has not advanced to the knockout stages since 1982, and it is a frustrating thing. Senegal had sparks of hope, and probably the best chance to advance but was sent home for accumulating more yellow cards than Japan becoming the first team in history to be sent home on the Fairplay rule in a World Cup. This is the point African fans transferred their support to France saying it is the only African team remaining in the tourney. 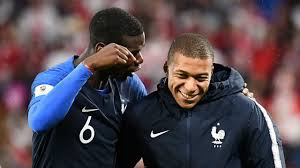 Africa was left out of the tourney from the last 16, putting her hope in the hands of Kylian Mbappe, Umtiti, Mousa Dembele and other 12 Les Bleu members with African blood and skin. However, Africa should not in a moment think that the connection is what is giving France an edge. France success and African failure should be attributed to one and the same thing. The policies in developmental football, where France has done well and Africa has generally failed to kickstart. This should be a moment for Africa to reflect on how football can be improved in the continent and stop gloating over the success of French citizen. Africa needs to put its hands to work, every hand that can be put to work. Hands to deal with disorganization, lack mentality, underdevelopment and the biggest monster, corruption. That day when these maladies will no longer be an impediment to team progress from the continent and making it to the late stages of the World Cup. Every African should long for that day. Kylian Mbappé (striker): French-born to a Cameroonian father and an Algerian mother. Plays for Paris Saint-Germain. Ousmane Dembélé (striker): French-born to a Nigerian/Malian father and a Mauritanian/Senegalese mother. Plays for Barcelona. N'Golo Kanté (midfielder): French-born to Malian parents. Plays for Chelsea. Thomas Lemar (midfielder): French-born and is of Nigerian/Guadeloupe descent. Plays for Monaco. Adil Rami (defender): French-born to Moroccan parents. Plays for Marseille. Steve Mandanda (goalkeeper): Born in DR Congo. Moved to France as a teenager. Plays for Marseille. Djibril Sidibé (defender): French-born to parents of Malian descent. Plays for Monaco. Samuel Umtiti (defender): Born in Yaoundé‚ Cameroon. Moved to France at the age of two. Plays for Barcelona. Corentin Tolisso (midfielder): French-born. His father has roots from Togo. Plays for Bayern Munich. Paul Pogba (midfielder): French-born to Guinean parents. Plays for Manchester United. Nabil Fekir (striker): French-born. Parents have roots in Algeria. Plays for Lyon. Blaise Matuidi (midfielder): French-born to an Angolan father and a Congolese mother. Plays for Juventus. Presnel Kimpembe (defender): French-born to a Congolese father and a Haitian mother. Plays for Paris St Germain. Steven Nzonzi (midfielder): French-born. Parents have roots in DR Congo. Plays for Sevilla. Benjamin Mendy (defender): French-born. Parents have roots in Senegal. Plays for Manchester City.